More often than not I find that furniture designed for little ones screams `kid’s furniture’ through garish patterns and poor quality materials. It’s here Babyology readers that we can breathe a united sigh of relief with the world that is Weamo. Weamo Furniture is fun but functional, hard wearing yet ergonomically sound. We love the magnificent Midi Stool that comes in bright colours with divine names such as Strawberry Sundae (red), Sunflower (yellow) and Peapod (green) or the more subtle classic colours of Clotted Cream, Chocolate Brownie and Ginger Snap. They all sound good enough to eat! 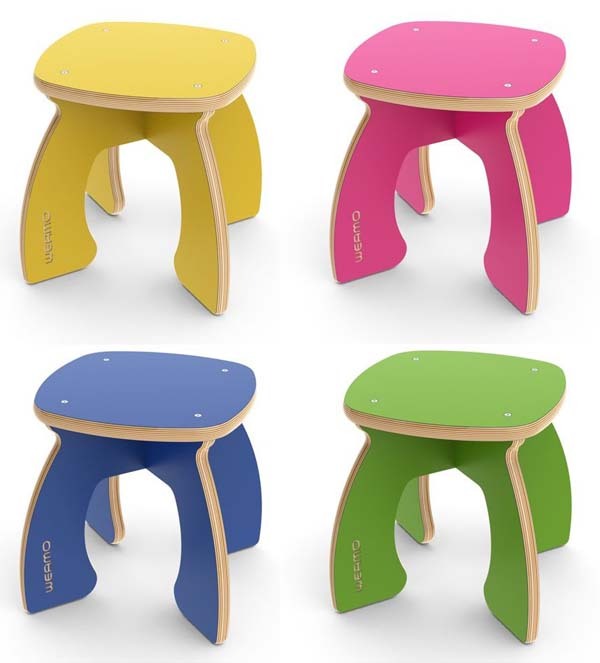 Each Weamo Midi Stool is finished in a coloured laminate that’s fantastic for cleaning and limiting signs of wear. The edges of the stool pieces are left raw to showcase the glorious birch plywood core. Weamo also make showstopping (or door-stopping) doorstops. 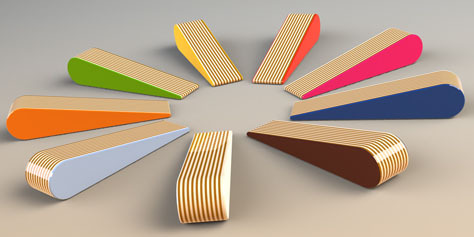 The Streamline Doorstop is exactly that – it’s a wedge shape that’s superbly modern and simple with a pop of colour. Unfortunately Weamo products are not yet available in Australia but we hope to see a stockist here soon!